The Oscars, the more commonly used term for The Academy Awards, are annual awards given to merit cinematic achievements. The Academy of Motion Picture Arts and Sciences (AMPAS), originally designed to promote the image of the film industry and resolve labor conflicts, oversee the awards ceremony. Today, voting is done by The Academy, which is an honorary organization composed of different branches in the film production arena. It sustains a membership of approximately 6,000. Being nominated to serve as a voter requires an invitation by the Board of Governors. This Board determines your eligibility based on a competitive nomination. Members of The Academy usually vote within their category of expertise (for example, members that are directors are the only ones who can vote for directors). Some exceptions include the categories of Foreign Film and Best Picture, in which all members are allowed to vote. The first Oscars ceremony was held at the Hollywood Roosevelt Hotel in 1929, which hosted about 270 people and awarded 15 statuettes. The ceremony only lasted for about 15 minutes, since the winners were already announced three months prior to the ceremony. Today, the winners are announced by opening a sealed envelope, revealing the name of the winners of each category. Categories include Best Actor in a Leading Role, Best Actor in a Supporting Role, Best Animated Feature, Best Cinematography, Best Director, Best Documentary Short, Best Makeup and Hairstyling, Best Original Score, and Best Visual Effects. For a film to be eligible for nomination, it must open in the previous calendar year from midnight, January 1 to midnight December 31, in Los Angeles, California. Films must also last a minimum of 40 minutes; the only exception is short subject awards, which have different requirements. In order to confirm the credits of the films, producers are required to submit an Official Screen Credits form by a certain deadline. The winners of the categories are given Oscar statuettes. To date, approximately 2,809 statuettes have been presented. They stand at 13.5" tall and weigh 8.5lbs. It presents a gold-colored britannium knight holding a crusader's sword and standing on a film reel, which is a black metal base. The reel has five spokes, which stand for the five different braches of the Academy (actors, directors, producers, technicians, and writers). The Best Foreign Language Film category was introduced at the 29th Oscars ceremony in 1975? The cost of tickets for the first Oscars ceremony was $5? 2014 Winners included 12 Years a Slave for Best Picture, Matthew McConaughey for Best Actor (Dallas Buyer's Club), Cate Blanchett for Best Actress (Blue Jasmine) and Frozen for Best Animated Film. The televised ceremony in 2014 drew up to 39.3 million viewers. In the weeks after the nominees are announced, you may hear your U.S. coworkers discussing their best guesses as to who will win, or there may even be a pool or contest in which a prize is awarded to the person who can guess the most winners. 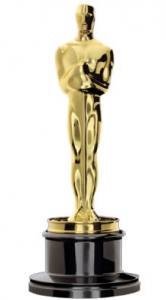 Sometimes pools will award a prize provided by the office, or all participants in the game may be asked to put in some money so that the winner gets all the money once the Oscar winners are announced. Another popular U.S. tradition is an "Oscar Party" where an individual may host a viewing party for their friends and family members to watch the Oscars together. Definitely consider attending an Oscar Party if you are invited to one or you could even host one yourself. Be sure to start the party early enough to see the stars arriving on the red carpet! Sunday, February 22, 2015 will mark the 87th Academy Awards Ceremony. It will be held at the Dolby Theatre in Los Angeles, California, and you can watch it on ABC.